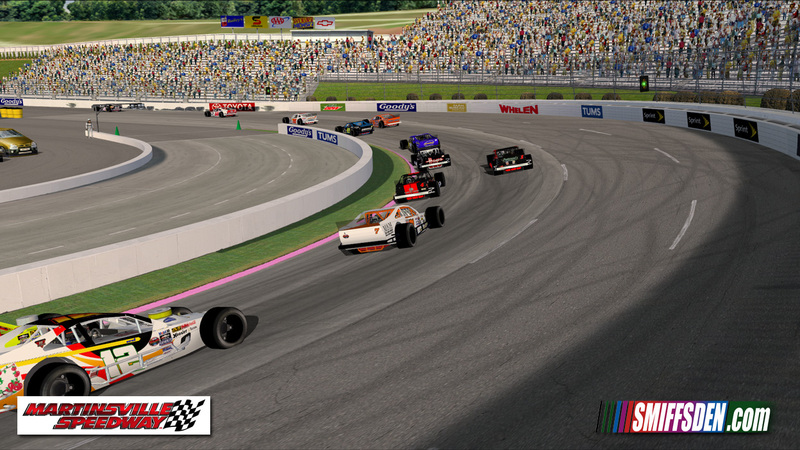 This is a fully updated Martinsville track for NR2003 scratch built from the original. 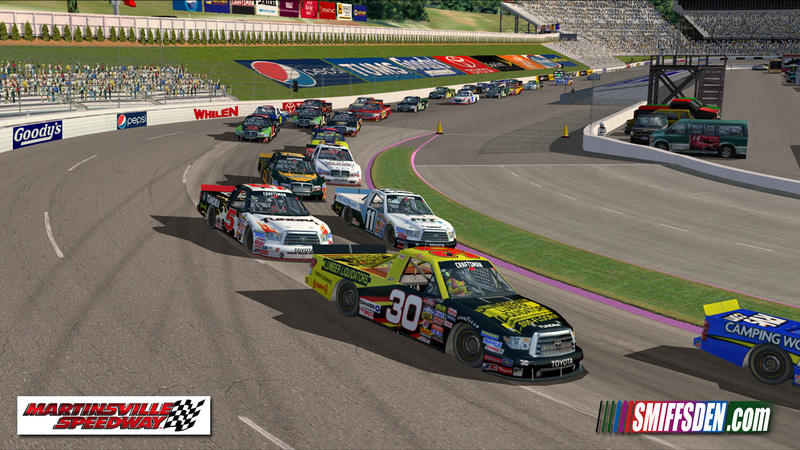 The track was originally built for the V8Thunder league in 2010, updated in the Spring of 2011, and again now for the Fall 2011 race, at this point the AI issues were fixed and the track is now available for general release. Adjusted the banking in the corners to be more realistic. Added multigroves to allow for lots of side by side running. Many TSO's have been updated or improved. Pink curbs have been added as per the fall race. Caution & Pacing rules tweaked. 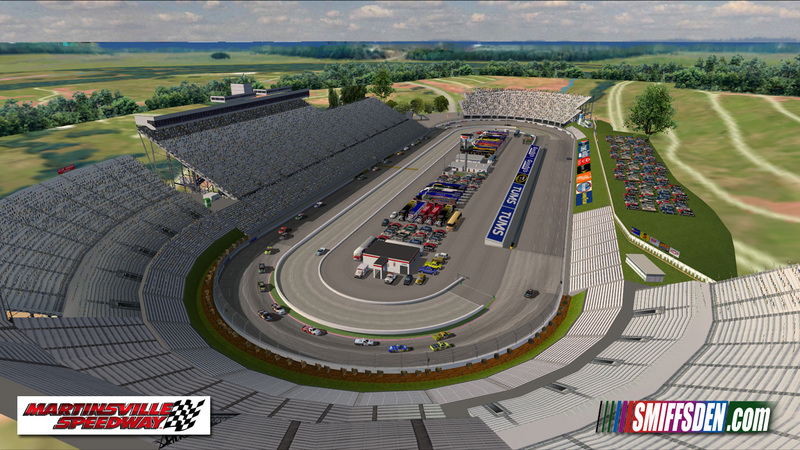 Added the Martinsville hills around the track and some additional far distance objects. A.I. has been tweaked by myself and JRFranklin, they were rushed so may not be perfect. Inside the FPS_SAVING folder are 6 3do files which may go some way to improving FPS, especially on older machines, they will remove the video screen and make it a static object, and remove the track surface detail. The track surface detail is only viewable on ALL trackside objects, but it's quiet FPS intensive so if you are borderline, disabling these by using the alternative 3do's may help a lot. Notes: On All Trackside Objects the entire track, including grandstands, infield objects, people etc. etc. is dynamically lit. This means the items are lit from the Sun (like the cars and track surface/walls), so if they are not in direct sunlight, they will have a shadow either cast on, or casting from them, this may take a while to get used to, but it's worth it. The Sun and lighting of the track has been adjusted to make the track feel like a late afternoon race, the sun is quiet low in the sky behind the main grandstand that in turn casts a huge shadow over part of the front stretch, this shadow has been made up of textures and shadow maps so depending whether you have shadows turned on, will depend how it looks. If you experience low fps, first of all try turning down trackside objects to Some (which will turn off the dynamic objects), then if things don't improve, turn off ground shadows from everything apart from cars, that should be enough, if not, turn all shadows off, you'll loose a lot of immersion, but at least you'll be able to race. The Pace Car is located in pit stall 8, this is normal and the stall is unused by player/AI. This was done to fix the many bugs that effect the original track, including Pace Car deployment and when/how he picked up the leader. When the caution comes out, 99.9% of the time the Pace Car will wait for the leader to finish the lap he is on before going out, instead of flying out randomly like he does on the original track, hopefully this should avoid the check up wrecks that have happened previously when we raced here. The track has had it's caution sensitivity reduced, like Mallory Park had, this means that depending where a car is spinning, it may not automatically throw a yellow, you can override this by adding !yellow$ to one of the quick chat messages but it's generally pretty good, single car spins won't bring out a yellow unless they are on the racing line. Pace Speed is 35mph, same as Pit Road speed. There are some landmines in the infield, notably around the center section, if you hit one just right you can do 3000mph but be warned they may crash the game - they can be fixed but I didn't, yes I'm evil. There are a few signage issues, mainly that they are best guess, this track is being used the week after the actual race so most of the trackside signage is estimates based on photo's posted on the Martinsville facebook page in the weeks leading up to the race and Cup practice. Depending on machine specification, sometimes the far trees will bleed through the nearer ones, this only happens on some PC's and appears to be a bug of the game rendering engine or GFX card. The track surface textures are from another short track in the works, and were basically shoehorned in at the last minute, as such they are not perfect but I think you'll agree, they really add to the immersion. Report to Smiffsden facebook page. JRFranklin - for his work on the AI. Revamped Reloaded - some textures, and the LP files/original AI settings, were nicked from their 2009 track. 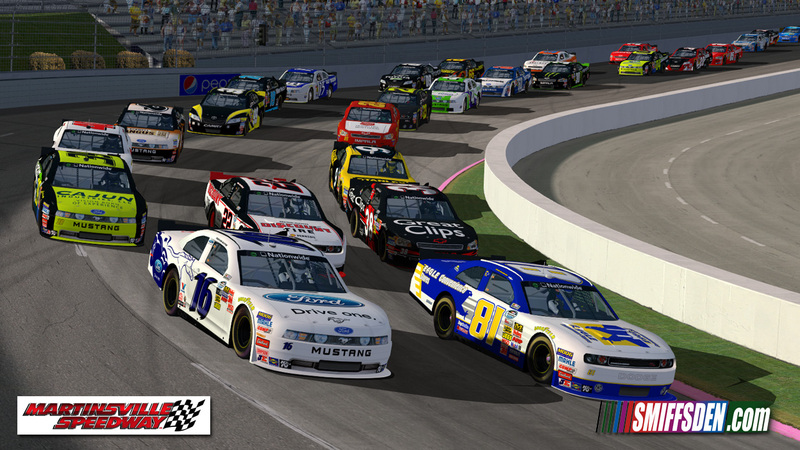 The caution lights and infield haulers are also originally from Revamped Reloaded's Shared Folder Update with some updates/tweaks by myself so they would work with the dynamic lighting. 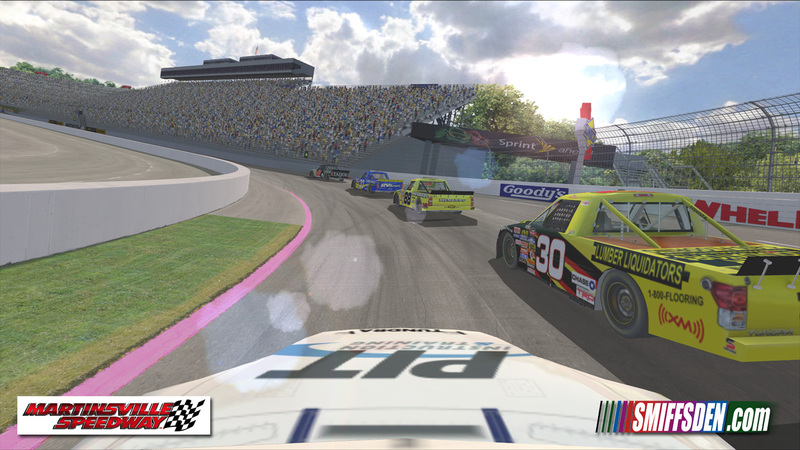 Be sure to checkout NR2003 Tracks - http://www.nr2k3tracks.com for all your up to date Nascar Racing 2003 Season mods and tracks. On a full grid with a full pace lap, some cars would crash into the pitwall, I have uploaded a fix for this, which also includes a fix for the start/finish logo's showing on the cars as they pass, this doesn't warrant a new version number as it doesn't affect compatibility.